Christmas is one of the most extraordinary times of the year, especially for the kids. It is one of the few holidays that children all across the world look forward to. They forget the rest of the year and even the days to come for this magical day. There are several reasons why kids love Christmas. They love the trees, decoration, and lightnings that go along with Christmas. They love getting gifts from their parents and grandparents. And, how can you forget the food? Kids love waking up on a Christmas morning to the smell of cinnamon cookies. The sweets and foods are much better around Christmas than any other time of the year. Besides, they also love indulging in Christmas games and other fun activities. Here are some fun Christmas activities for kids that we have compiled for your help. The Christmas tree is one of the most cherished Christmas customs. The evergreen tree signifies the ever-burning fire of life. Each year, millions of Christmas trees are purchased and decorated. Decorating the Christmas tree with kids can be a fun activity. Encourage your kids to make their decoration using tin foils, cotton balls, candy canes, yarn and other items found in the house. Coloring is one of the best activities to keep your child busy during the Christmas. There are several Christmas coloring pages that you can print out for your kids. 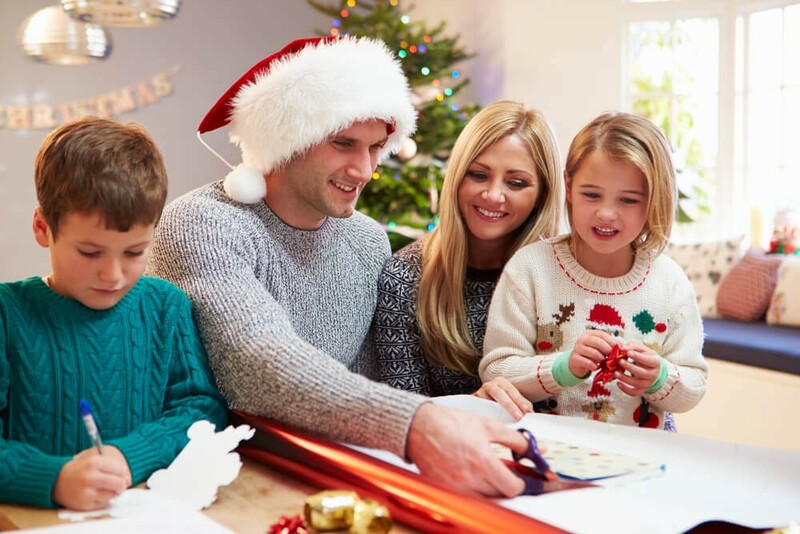 Your child will have a great time bringing the ornaments, Santa Clause, candy canes and stockings to life. This fun indoor activity will get them in the holiday spirit during their winter vacation. Encourage your child to use glitters, stickers, and watercolors to make the coloring sheets look presentable. This Christmas, why don’t you hang the stockings made by children instead of the readymade ones? We’re sure your child would be elated waking up on Christmas morning and seeing the stocking made by him hung on the mantelpiece. Children can decorate a readymade stocking with sequins and glitters. They can also make Christmas stocking from brown paper. Tell your child to draw a large stocking on a thick brown paper. Then cut out two copies of this stocking. Younger children may require assistance from adults while cutting the paper. Glue both the stockings around the edges and then punch holes. Weave a string of yarn in and out of the holes and tie it in a knot. Children can decorate the stocking anyway they like. You can also fill some goodies in the stockings to surprise your children. Kids can create amazing things using play dough at Christmas. It will keep the kids entertained for hours during their Christmas break. Children can make candy canes, snowflakes and several other things using play dough. Ask them to sprinkle some glitters or sparkling powder to make the candy canes and snowflakes standout. You can also display their works to encourage their creativity. Making Christmas cards for friends and family is a nice way to spend some quality time with your children. The tradition of exchanging Christmas cards started in Britain in 1840 when the first public postal delivery began after the invention of the railways. This activity is perfect for preschoolers and primary school going children. Grandparents, especially, will love receiving handmade cards by their grandchildren. Dominoes are another fun game your child can indulge during Christmas. Kids can try several variations of this game. Print out some snowflake cards for your kids to play. Little ones can use the snowflake memory game to practice number recognition and counting. Older children can use the snowflake cards as a memory game. When you are cooking with kids, it is all about having fun and a delicious treat at the end. So put on your apron and start cooking these delicious recipes with your kids. Is there anything more soothing than a mug of hot chocolate on a Christmas eve? We think not! Hot chocolate will calm them down and will help them go off to sleep after the Christmas party. Make sure to assist your child while he/she is pouring the hot milk into a mug. Christmas is incomplete without cookies. Even children love to assist their mother in preparing cookies. Press the cookie cutter into the rolled out cookie dough. Then tell your child to decorate and personalize the cookie. This activity will boost your child’s fine motor skills with all that squeezing and rolling of the dough. Christmas baking would be incomplete without gingerbread cookies. The cinnamon, nutmeg, cloves, molasses and ground ginger in gingerbread cookies make the house smell delicious. Involve your little one in your family by letting him decorate these spicy cookies. She can decorate the cookies with raisins, currants and red-hot candies for the eyes and the buttons. You can also use the gingerbread cookies to decorate the Christmas tree and to use as gift tags. Kids totally enjoy making peppermint creams. They enjoy cutting it in different shapes and sizes. Peppermint creams are easy and quick to make and are very delicious. Also, it requires no cooking so children can make peppermint creams easily, of course with the guidance. This melt in the mouth treat will also make perfect homemade gifts. There are multiple benefits of cooking with children. It will strengthen the muscles of your little one and will improve the hand-eye coordination. It will also distill a sense of pride and achievement in your children. Alphabet games are very versatile. They work well as both a puzzle and a game. The game requires some preparation like cutting out the letters. It will prove therapeutic for children amidst all the hustle and bustle of Christmas. Fill in the blanks worksheets is a great way to learn some new spellings. Print out the sheets from the internet and bind a set of worksheets for home and classroom use. It will keep the children busy until their holidays. Handwriting worksheets are popular all year so that they will make fun yet educational activity during the Christmas as well. Print out several copies of handwriting worksheets or give them a handwriting book to give your children lots of good handwriting practice. The long, cold winter evenings are a perfect time to enjoy some stories Christmas stories with children. Here are some of the best Christmas stories that you can enjoy with your kids. You can also ask your children to read out the stories. It will improve your child’s reading and vocabulary skills. This story revolves around Bipper, the bear who does not want to hibernate like the rest of his family. This makes him an unusual friend. Caspar’s Story is a lovely Christmas story written by Pete Large. It is a tale about baby Jesus’s birth told through the eye of Caspar, one of the three wise men. Kids totally love Rudolph, the red-nosed reindeer. Print out some copies of Rudolph the Red-Nosed Reindeer for your children and his friends. We are sure they will enjoy reading out this cute story. Kids can also enact a play based on this story. Twas the Night Before Christmas is one of the most popular Christmas poems. Print out a few copies of this poem to enjoy with your kids. The Nativity play is a story that recounts the story of the birth of Jesus. The play is usually performed at Christmas. Many Christian-oriented schools put on a nativity play before the Christmas break. Kids dress up in costumes and act like human and angel characters. The infant Jesus is represented as a doll. You can also hold a Nativity play at your house on the Christmas eve. Even parents and grandparents can take part in the nativity play. Make sure the nativity play script is simple, flexible and adaptable enough to make changes right until the last moment. We’re sure your kids will enjoy indulging in these fun activities. You can also suggest some Christmas activities for kids in the comment box if we have missed out on any. We would love to receive your favorite Christmas activities for children. And don’t forget to check out our princess coloring pages.